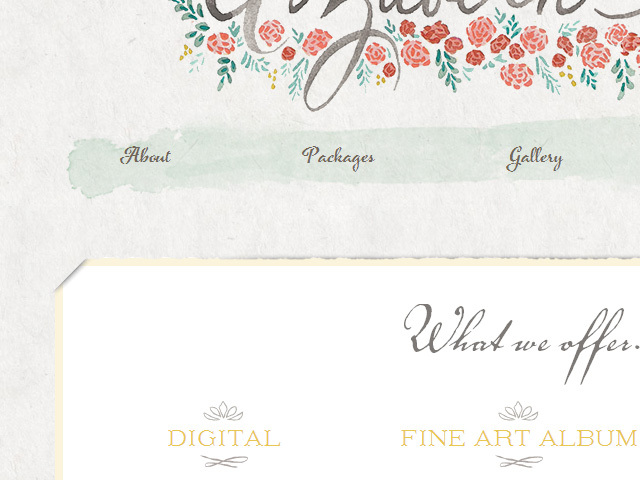 … Sometimes however a client comes along, drops a gorgeous watercolour logo in your inbox, says “can you do anything with this?” and everything else falls neatly into place, which is exactly what happened with Lizzy and Rhoddy from Essex-based wedding and portrait photography business Elizabeth Lois Photography. Lizzy had been trying to get a brand that matched the direction she wanted to take the company and enlisted the help of the immensely talented Chelsea Petaja from Oh My Deer Handmades, who produced a stunning watercolour logo with delicate floral details. With a logo as strong and striking as this, it didn’t seem right to try to detract with too many other dominant details on the page. Instead the design had to be complementary to the hand-painted watercolour aesthetic, which meant hand-made paper textures, paintbrush strokes, sketched details and discrete trimmings. Azalea Rough and Voluta Script Pro were used for the menu and page headings respectively, both hand-drawn fonts that matched well with Chelsea’s logo brushwork. Additional headings used Jessica Hische’s Brioche which provided a more structured contrast to the other text. Scanned torn-paper edging was used to give a little depth and texture to image frames and key areas, and to keep the general paint-and-paper vibe going. 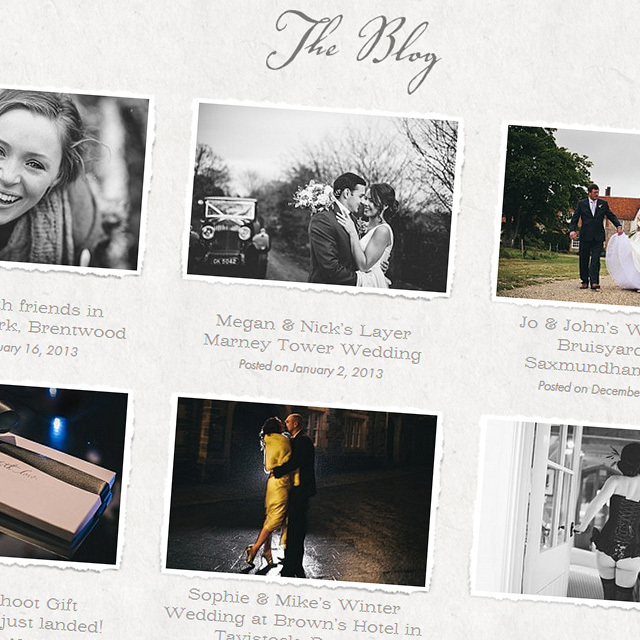 Finally, for the blog we decided to go for a photo-grid approach. 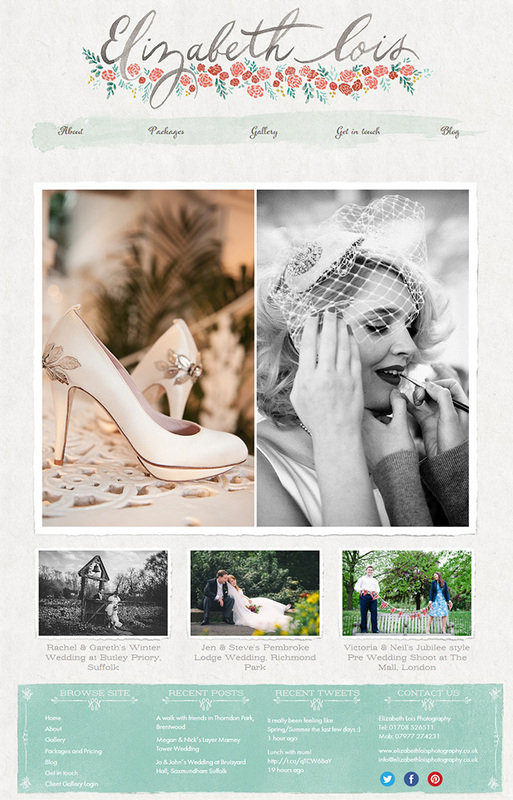 The guys are prolific bloggers, so it felt right to keep text to a minimum on the listing page, maximise the number of posts displayed at a time, and to let Lizzy’s wedding, portrait and boudoir photography do the talking! Thanks to Lizzie and Rhoddy for being great clients with lots of ideas. 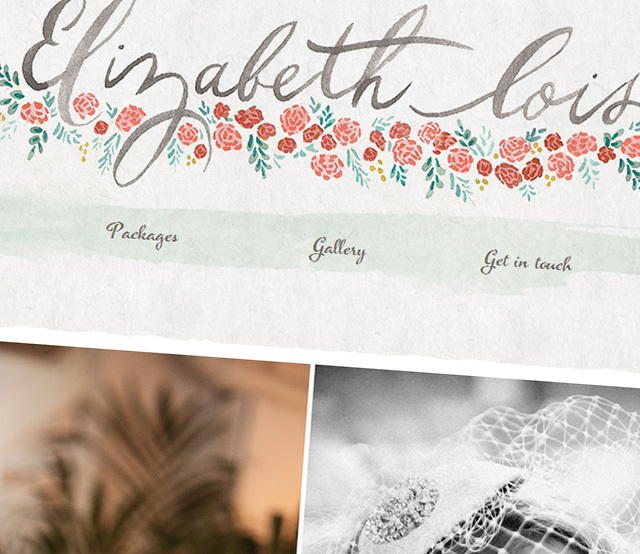 If you’d like to see more of their work, take a look at their site at www.elizabethloisphotography.co.uk.